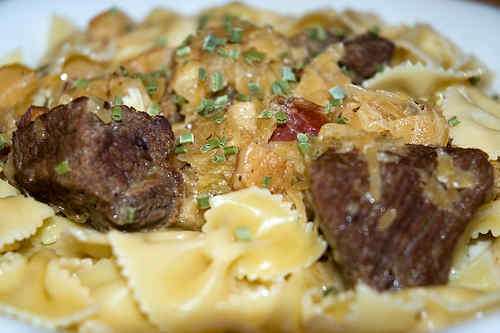 Beef cooked with sauerkraut and white wine and served over pasta. In the pressure cooker it takes only 20-25 minutes for the beef to become nice and tender. Set pressure cooker over high heat. Add oil, beef and caraway seeds. Brown meat from all sides. Remove meat from pan. Reduce heat to medium-high. Cook onions, turnip and bacon until the onions just start to brown. Return meat to pan. Add sauerkraut, white wine and salt. Cook with high pressure for ca. 25 minutes. Release pressure. Stir in sour cream. Adjust seasoning with salt and pepper. Looking at step 3 here, I think you have a typo as isn't this where the browned meat should be added back along with the saurkraut, wine and salt? Yes, of course, thanks a lot! It's now corrected (correction underlined).